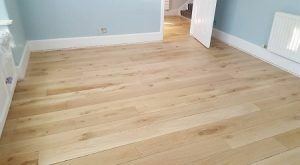 Choose our expert and affordable wood floor repairs in London. Floors are restored when they have become dull, scratched or stained. Wood floors that have suffered some kind of damage must first be repaired. The expert craftsmen at FK Floor Sanding will assess the damaged floor to determine the cause and propose a solution. There are many things that can cause severe damage to a wood floor. However, in the UK the most common ones are water (rising damp and wet rot), woodworm and dry rot. All of these can cause a great deal of damage if not dealt with effectively by professionals with the experience to do so. Some are a threat not only to the timber but the surrounding areas such as walls. The first step is to determine what is damaging the wood floor. Our experts will also assess the degree or extent of the damage. Based on this we will outline a course of action to deal with the problem and a quote. It’s then up to the client to decide whether they wish to proceed or not. However, you should keep in mind that neglecting the problem can lead to severe or irreparable damage to the floor and the surrounding areas such as walls or other wood items. Although rising damp looks alarming it is easier to treat than other problems. This form of damp affects both floors and walls. The effects of this type of damp look unsightly. In addition, if mould grows on the damp areas this is also a health issue. As the damp spreads the damaged area also grows. Our teams locate the source of the damp so they can address them and take steps to dry the timber. Wet rot results in very damp timber that can look darker in colour than the rest of the floor. Floor boards may even crack or start to crumble and break down. As with rising damp the first step is the eradication of the source of the damp. Once we do that, we dry out the wood. We can then go on with the repair work if part of the timber has been lost or there are gaps between the boards. However, that is a separate issue and the client must decide if they want the work properly done. Why choose our wood floor repairs in London? Dry rot is harder to deal with and can have devastating effects on a wood floor. The reason for this type of rot is a fungus that grows and spreads in wood, especially if there is some small degree of damp. This causes the wood to break down and rot. If left unchecked dry rot will destroy a floor and surrounding wooden objects. Our experts use products that are specifically formulated to eradicate the fungus and prevent it spreading. Regardless of the nature of the damage, once we complete the assessment, the work on the wood floor can begin. This may involve sanding, staining or finishing depending on the client’s preference and the overall state of the repaired floor. If you live in London and have a wood floor that is in need of repairs call us on 020 3909 7641 and we will make an appointment to assess the floor in question and make recommendations and provide a quote for our professional wood floor repairs in London.